Sunday was my Sewday so I was able to start on the border for the Lincoln quilt. The directions say to sew all the squares together in row 1, row 2, & row 3 then sew the rows together before attaching them to the quilt center. After studying the border diagram I decided to make rectangular blocks of 4 squares by 3 rows instead. If my math is correct I will need 9 blocks for each side along with the 4 corner squares to complete the border. When I first started designing this quilt, my thought was to find a black background fabric with tan & brown flowers? paisleys? something for a solid fabric border. The closer the quilt center got to completion, the more I realized that idea was a bad one. 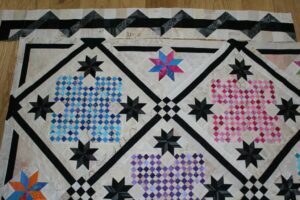 In my opinion it would make the quilt dark and overwhelm the center, so I started looking for a better border idea. I found this one and really like it – it echoes the black frame around the blocks, relates to the black/dark gray LeMoyne stars and has enough light background to keep it light and airy. Hopefully by next Monday I will have at least two of the borders attached to the center. Much better than a heavy dark border. Your solution makes my heart sing! It’s perfect. Beautiful quilt! Your border solution is perfect.